The 17.3" GT75 Titan Gaming Laptop from MSI is designed for gamers who favor performance above all. 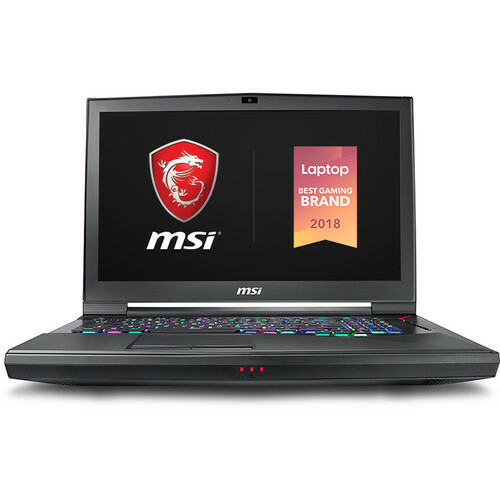 Specs-wise, it's equipped with a 2.2 GHz Intel Core i7-8750H six-core processor, 32GB of DDR4 memory, a 512GB PCIe NMVe SSD paired with a 1TB 7200 rpm HDD, and an NVIDIA GeForce RTX 2070. Thanks to its dedicated graphics card, you'll be able to enable additional graphical options and turn up in-game settings to enjoy games at their best. Additionally, its 17.3" 1920 x 1080 IPS display features a 144 Hz refresh rate and NVIDIA G-Sync technology for fluid gaming. Should you need more storage, you can connect external storage solutions using its multiple USB ports. Other integrated features include Thunderbolt 3, HDMI, Mini DisplayPort, 802.11ac Wi-Fi, Bluetooth 5.0, a backlit keyboard, a webcam, microphones, speakers, and a 3.5mm combo audio jack. The operating system installed is Windows 10 Pro (64-Bit). The SteelSeries mechanical keyboard features customizable built-in RGB lighting. Select a variety of colors, lighting effects, and even special genre-specific keys. Cooler Boost Titan features dual fans and 11 heat pipes to efficiently cool the CPU and GPU. The MSI Shift feature provides you with one-click system optimization for specific power options including: Turbo Mode, Sport Mode, Comfort Mode, and ECO Mode. The GS75 Stealth is built with an ESS Sabre Hi-Fi DAC with support for 24-bit / 192 kHz sampling over headphones. Should you opt for speakers, its Dynaudio sound system can offer a +10 dBA volume increase. Moreover, it comes with Nahimic 3 and Nahimic VR for customizable, immersive audio for a 360° experience. Developed with BlueStacks, MSI APP Player lets you play your favorite mobile games on the PC. Equipped with Killer Wi-Fi, this laptop can provide you with a smoother gaming experience by automatically prioritizing game traffic. You can also manually adjust the bandwidth and prioritize applications as needed. Box Dimensions (LxWxH) 22.0 x 16.5 x 4.5"
can the SSD be upgraded to a 1T (2x512?) also later upgrade the HDD? Yes, this model has 3 x m.2 slots for SSD upgrades. However it has only 1 x SATA port for an HDD. You would have to use a single HDD, and not a dual setup. What is the rotational speed of the 1TB Harddrive, and does this use one or two power adapters? Thank you.